I know I said we'd start on Monday, well I think its Monday again today...... Ever had those days? If this is any indication as to how the rest of the week will be going. I'm in for a real treat.....Alrighty then,. since we have that behind us. Just wanted to let you know that I have missed everyone. I had a wonderful vacation, time off was very well needed and the trip was nice. My husband and I went to Myrtle Beach. I'll post a few pictures later in the week. Let's review the next procedure that I researched. This procedure is the second most common weight loss surgery performed by the Duke Center for Metabolic and Weight Loss Surgery. I haven't researched the stats on this procedure for the number of surgeries performed using this method in our area. But I'm sure if you wanted to research it you could probably find some numbers. This surgery has a similar goal to Roux-en-Y gastric bypass, from what I've researched it makes the stomach smaller to reduce the amount of food you take in and to help your brain generate a feeling of fullness after eating small portions of food. But, instead of reducing the size of your stomach, the procedure does its job by suturing an adjustable band around the top portion of the stomach. The band can be adjusted with a specialized needle -- usually in a clinic visit -- so you can have it loosened or tightened as needed to reach your weight loss goals. 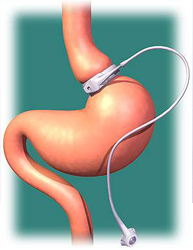 Gastric banding is considered the least invasive method of weight loss surgery. The procedure can easily be reversed if necessary. This is similar to the lap band. On February 16, 2011, the FDA approved gastric banding surgery for patients with a body mass index (BMI) of 30-35 with at least one comorbid condition (diabetes, hypertension, sleep apnea, etc.) or 35+ without. The requirement was previously a BMI of 35 for patients with a comorbidity and a BMI of 40 for patients without a comorbidity. This is good news for lots of people that have been trying for sometime to get approved, this should improve their chances greatly. By lowering the numbers a bit, this should open the windows up to getting approved quicker. Or I would think it would. Laparoscopic adjustable gastric banding leads to loss of about 40% of excess weight, on average. Someone people who are 200 pounds overweight could expect to lose an average of 80 pounds after gastric banding. However, these results vary widely. The risk of death due to gastric banding surgery is about 1 in 2,000. A small incision (less than 1/2 inch) is made near the belly button. Carbon dioxide (a gas that occurs naturally in the body) is introduced into the abdomen to create a work space for the surgeon. Then a small laparoscopic camera is placed through the incision into the abdomen. The camera sends a picture of the stomach and abdominal cavity to a video monitor. It gives the surgeon a good view of the key structures in the abdominal cavity. A few additional, small incisions are made in the abdomen. The surgeon watches the video monitor and works through these small incisions using instruments with long handles to complete the procedure. The surgeon creates a small, circular tunnel behind the stomach, inserts the gastric band through the tunnel, and locks the band around the stomach. This pouch holds approximately ½ cup of food, whereas the typical stomach holds about 6 cups of food. The pouch fills with food quickly, and the band slows the passage of food from the pouch to the lower part of the stomach. As the upper part of the stomach registers as full, the message to the brain is that the entire stomach is full, and this sensation helps the person to be hungry less often, feel full more quickly and for a longer period of time, eat smaller portions, and lose weight over time. Adjustable gastric bands hold between 4 to 12 cc of saline solution, depending on their design. When the band is inflated with saline solution, it places pressure around the outside of the stomach. This decreases the size of the passage between the pouch created from the upper part of the stomach and the lower stomach and further restricts the movement of food. Over the course of several visits to the doctor, the band is filled until the optimal restriction has been achieved – neither so loose that hunger is not controlled, nor so tight that food cannot move through the digestive system. The number of adjustments required is an individual experience and cannot be accurately predicted. I've had a friend that had the lap band which is similar to this one where she had to do fills and the disadvantage of this is.... You don't know how many you will need. Simply because its a trial basis until you figure out when you eat how much you eat, vs how much you don't eat.how many times you need it filled or some of the solution taken out. This might not make sense. If you eat too much, then this will require you to have it tightend (or filled) if you don't eat enough then you will need some of the solution removed. So this will allow you to be able to eat more. And my research found that while checking with my insurance company as well as yours. You might want to present the question to them in the form of this question. "will you pay for the fills" Or a portion of them? My insurance company wouldn't pay for them. And at the time, they were $200.00 per fill/or removal. This can be costly... on your behalf.